Jay Cutler should be grateful for what Josh McCown has done. The Chicago Bears are alive! Sure, it might have as much to do with the fact that the Detroit Lions can’t get out of their own way and Aaron Rodgers is still hobbled by a broken collarbone, but Chicago’s 45-28 win over the Dallas Cowboys on Monday was still a season-extending W.
And the win has a two-fold significance. First, as mentioned, it took advantage of the Bears’ division stumbling. Second, it represented a less-desirable development: a potential quarterback controversy, despite head coach Marc Trestman siding with a healthy Jay Cutler over Josh McCown on Wednesday. Trestman also said that he’s optimistic the eighth-year quarterback will have recovered enough from his high ankle sprain to play in Week 15, but an official announcement will come Thursday. In the NFL, you can’t just be happy with the impressive play of your backup quarterback when the starter goes down. Instead, you have to also use his play as a potential existential crisis that could drag the squad down with it. McCown’s five total touchdowns in the win over the Cowboys — building on an already strong season in which McCown had thrown nine touchdowns to only one interception — raise a question, in the minds of many: Even if/when Cutler finally recovers from the various injuries that have dogged him this year, can you really bench a guy as hot as McCown has been? The Green Bay Packers lost Aaron Rodgers. They went through three quarterbacks during a five-game tailspin, going 0-4-1 before finally pulling out a win this week. Their playoff chances, rock-solid before Rodgers’ injury, are now slim, though not none. Instead, they basically demand that the Packers win out, and the Packers winning out will likely require a return from Rodgers as soon as possible. Video: Will the Bears make the playoffs? But Rodgers does not appear to be healthy, and almost certainly doesn’t want to return before he’s healthy and, subsequently, not in danger of suffering an aggravated or even-worse injury. Rodgers is in a pickle, and even aside from that pickle, his team basically swan-dived out of the playoffs while he was gone. From the perspective of Jay Cutler, who will return to a Bears team more or less in control of its own destiny with regard to the playoffs, McCown has done him the ultimate favor: he has kept his team alive. You can’t say the same about what Seneca Wallace, Scott Tolzien and Matt Flynn have done for Aaron Rodgers. Now, Cutler has the chance, once he is healthy, to re-enter and perform on a grand stage. He could fail, of course, in which case the hordes will descend upon him; but he could’ve failed anyway, Josh McCown aside. 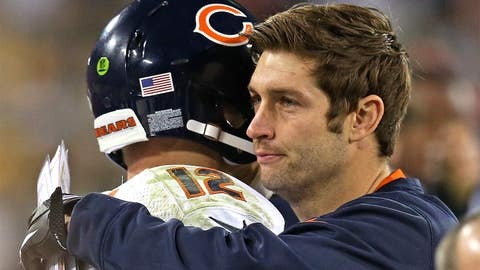 And for a quarterback like Jay Cutler, who has always been judged extremely harshly due to a reputation for weakness and unpopularity — it doesn’t matter that this reputation is unjustified; it still exists — failure is always nearby. What does he have to be mad at McCown for? It doesn’t matter what happens this season: Cutler will be a starting quarterback next year, whether it’s with the Bears or not. But wait, you say, you’ve got it all wrong. The issue isn’t that Cutler should be mad at Josh McCown for performing so well in his absence. It’s that Cutler shouldn’t replace McCown at all. Let’s think about this. Josh McCown is 34 years old. He is older than all but two NFL starting quarterbacks, Peyton Manning and Tom Brady, both future Hall of Famers. McCown’s record in the NFL as a starting quarterback is 16-22, and before this season, he had thrown 37 TDs and 44 INTs. The five games he has started in 2013 do not at all reflect his performance in the 33 games he had started previously. The football he’s playing in relief of Cutler has, to this point, been outstanding. But if you keep McCown in, and a healthy Cutler on the bench, you’re counting on that play continuing into a meaningful December. And that is optimistic, to say the least.